Israel is being accused of destroying Palestinian crops by spraying excessive toxic herbicides that damaged both their food and water supply. Israel is being accused of illegally spraying toxic herbicides on Palestinian farmlands along the border between the Gaza Strip and the occupied Palestinian territories, causing significant damage to Palestine’s agricultural crops. Nearly 2 million Palestinians live on the Gaza Strip, which has been officially occupied by Israel since 2007. While Israel claimed that it was just using its planes to get rid of weeds and extra grass along the border with Palestinian territory, Palestinian officials have criticized the interference. “These chemicals cause damage to agricultural crops and harm farmlands. Israel has no right to spray herbicides on Palestinian farmlands,” Nizar al-Wahedi of the Palestinian Agriculture Ministry told the Anadolu Agency. Palestinian farmers have also claimed that while Israeli troops do spray weed killer around security fences to help them get a clearer view of the area, they often spray up to dozens of yards away from the fences, which severely damages Palestinian crops. Wahedi said the Palestinian Ministry is not aware of the exact composition of the chemicals sprayed by Israel, but that it is hurting crops, which goes on to hurt hundreds of thousands of Palestinians who are already suffering from Israel’s blockade. 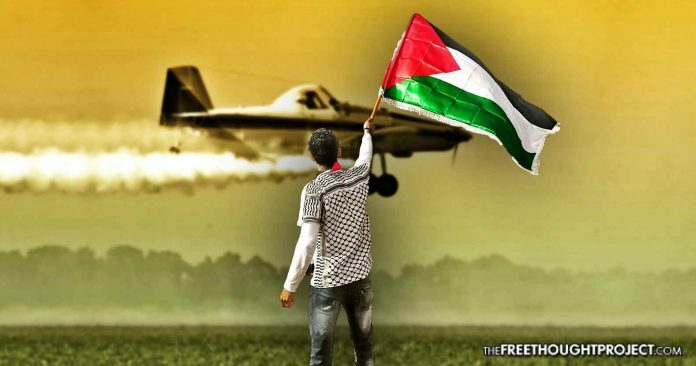 Press-TV reported that because Israel has banned the entry of basic commodities, farmers in Gaza “have resorted to the use of banned chemical substances to maximize crop yield,” which has created yet another health threat for farmers and consumers. Around 44,000 Palestinians work in agriculture—about 11 percent of the territory— and following an increase in exposure to harmful pesticides, there has also been an increase in Gazan cancer patients who reside in agricultural areas. This is not the first report of such illegal actions. In January 2016, Al-Jazeera reported that more than 300 acres of crops and farmland were damaged after a low-flying agricultural aircraft sprayed herbicides on to Palestinian farmlands along the eastern border. Anwar Abu Assi, manager of the chemical laboratory at the Ministry of Agriculture, said the herbicides continue to harm citizens by ruining the crops and then going on to ruin the water supply. “Herbicides are sprayed in high concentrations. Thus, they remain embedded in the soil, and then find their way to the water basin. This constitutes a real hazard for the population,” he said. Electricity has also been limited by Israel, and Gazans receive anywhere from 2 to 4 hours of electricity each day. After intense criticism, Israel has reportedly consented to allow up to 6 hours of electricity each day. The human rights abuses committed by Israel in its treatment of Palestinians living on the Gaza Strip serves as a reminder that while the United States pays close attention to Russia, Syria, and Iran, it often turns a blind eye when its closest allies are the ones abusing human rights.